Executive Chef Nelson Yap of the Commune By The Great Wall Kempinski in Beijing, China shares exciting recipes. Singapore native Nelson Yap was born to cooking. His mother, a restaurateur, greatly influenced him as a child, and a result he became a chef. 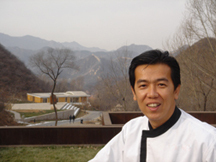 His culinary career has taken him from Singapore, to Saigon, Vietnam, and lastly to Beijing in October 2006, when he joined the Commune By the Great Wall Kempinksi as Executive Chef. Method: Using a medium pan with medium heat, sear the loin of lamb all over and put in oven at 160 degrees F for 4-minutes. Remove from the oven and cut into 3 pieces. Method: Cut the potatoes into cubes and put in boiling water. Boil until very soft, blend with milk and butter to puree, and season with salt and pepper. Method: Caramelize the sugar, dilute with water and vinegar, and bring to a boil. Add the mint leaf, truffle and boil for 1 minute. Thicken with diluted cornstarch. Method: Place a non-stick pan over medium heat, place the codfish on it and sear on both sides for 2 minutes until cooked. Blanch the carrot cubes in boiling water for 4 minutes. Season all of the vegetables and stir-fry them with olive oil in a sauté pan. Place on a warm plate. Method: Caramelize the sugar, dilute with water and simmer for 3 minutes, add Balsamic dressing and bring to a boil together with the basil leaves and garlic until reduced by half. Pass through a conical strainer, and taste before serving. Read the other articles on the Commune By The Great Wall Kempinski in the Hotels, Restaurants, Restaurants, and Spas sections. Read other articles on Beijing, China in the Destinations, Hotels and Resorts, Restaurants, Chefs' Recipes and Adventures sections. © January 2007. Luxury Experience. www.LuxuryExperience.com. All rights reserved.